My brothers and sisters, perhaps you don’t realize this but Lent starts on Wednesday! Since this is a season of penance and abstinence, I decided to focus today in a feast which although smacked right in the middle of this penitential season, provides us with an opportunity to experience a little bit of Christmas in the desert of lent. I’m speaking about March 25 the feast of the Annunciation of the Lord. In this day we celebrate the moment in which the archangel Gabriel appeared to the Blessed Virgin Mary and asked for her permission so that God the Father, through the intercession of the Holy Spirit, could conceive The Son of God in her immaculate womb. Now notice that this feast happens precisely 9 months before Christmas, so not only we celebrate the visit of the angel, but we also celebrate the moment in which The Son of God became incarnated; Which is a word invented by the Church to give a name to the the mystery that is an infinite God “becoming flesh and dwelling among us”. Usually, because we are so involved in our Lenten practices this great feast passes unnoticed, pretty much in the same way that when we are reciting the creed, we say this word without reflecting in its meaning and implications. The reality is that this word “incarnation” describes the most important event in the history of humanity. You might have never noticed this but at every mass we remember the incarnation, not in the creed, but in the preparation of the gifts we bring to the altar. 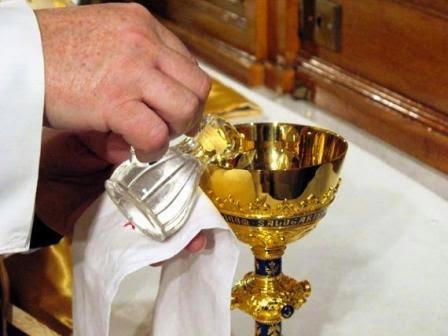 Usually as the offertory song is still been sung, the priest or deacon performs a very simple rite in which he adds a few drops of water to the wine while silently saying “By the mystery of this water and wine may we come to share in Christ divinity who humbled himself to share in our humanity”. In the incarnation the Son of God himself abandons the divine majesty of God the Father, and humbles himself to share in our lowly, corrupted and weak humanity, without gaining any of our sin or losing any of his divinity. Now this does not mean that somehow the son of God becomes like a bigger version of ourselves, but that he embraces all that we are, our weaknesses, our fears, our pains and makes them his, raising our humanity to a condition in which we can be sharers of God’s divine Nature, a condition we lost because of the Original Sin of Adam and Eve. Now you might be wondering where am I going with all this. Well the reason for this is because in the story of today’s Gospel we see very clearly what the incarnation is all about. Jesus willingness to embrace His humanity. In the Gospel we hear about of a leper who came to Jesus and pleaded “If you wish it you can make me clean”. St Mark says that Jesus was moved by pity for this man and that he touched the man and said “I do will it, be made clean”. Let's think about this action for a second, this man was a leper, because of this disease he was condemned to a life of solitude away from any human contact. Jesus touch did something more than heal him, it gave him back what he had lost, but Jesus did this in a very specific way; he voluntarily becomes ritually impure by touching a leper; but not only this, the reading says that this man went out and publicized what Jesus did for him, forcing the Lord to live outside in deserted places. By healing this man Jesus went from a normal traveling teacher to living the life of a leper. He took upon himself the misery this man had experienced because of his disease. The incarnation is the reason why we can live a life close to God, is the reason why we can be assured that God knows and understands our pains and tribulations. It makes God not a mysterious far away being, but a God who understands, when we are hungry, tired, hurt and discouraged; because of this mystery of God we can be certain that we are not alone in our human suffering. Of course the end result of the incarnation is what we celebrate on Good Friday, what we prepare for during the season of Lent, God taking upon our own sufferings on the cross. My prayer for all of us today is for a lenten season which allows us to enter deeper into the mystery of the incarnation so that we can all come to share in Christ divine life who humbled himself to share in our lowly humanity.